You have to set up a meeting, strategize your marketing, plan your budget, monitor your sales, do networking, etc. Do they ring a bell? Daunting, right? As entrepreneurs, you are your own boss. It may sound exciting but honestly, it also means that you have to manage your resources accordingly. And one of the most important resources that we often neglect is time. Time is gold. We only get 24 hours a day, thus, maximizing every second is formidable, especially for entrepreneurs who are busy scaling growth for their businesses. But, how can you be effective with time management if there are so many things that require your attention? 1 – Schedule, if possible, everything! You can’t trust your memory. Even if we believe we are keeping in mind all the things that we need to do accurately, most often than not, we might have forgotten something or misremembered an important detail. For busy entrepreneurs, you can’t diminish the value of writing down, if possible, every task at hand. Find what works for you. You can either be more traditional by keeping a pocket notebook that you can always carry around or keep an online calendar. There are plenty of time management and scheduling calendar services online. We all know the popular Google Calendar. 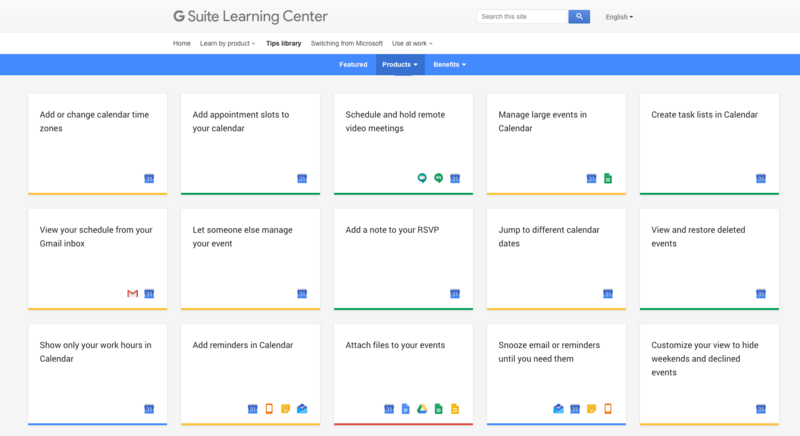 But there are more cool hacks and under-the-radar features that you can use to make your life in Google Calendar much easier to organize. Below are 16 of our favorites. Procrastination is a very common time wastage. For some entrepreneurs, delaying or postponing a task is sometimes because of the lack of focus or thinking that they still have plenty of time. But, most of the time it’s just that you don’t want to start. The 2-Minute Rule can help overcome your procrastination and laziness. Here’s how: for any of your task that you’re delaying, start just devoting two minutes of your time. If you need to craft a letter, just write two or three sentences in two minutes, and you’ll find yourself finishing the entire letter. Want to finish your budget and expense report? Try logging your records, and you’ll end up completing it in no time. The 2-Minute Rule doesn’t always have to be finishing the task entirely, it’s more on the process of actually starting doing your work. Don’t waste your time figuring out when to start, but rather use this time in taking action. We have said earlier that in time management, the key is not about getting more and more time. It’s mostly regarding how you change your attitude to manage your time. In managing your time, attention and focus are very crucial. Why? This is because even if you allocate a portion of your time for a specific task but actually spend it switching from one task or another, it will be more likely that you will end up with a mediocre result. The way you control your focus and attention impacts directly your productivity. If you are too distracted by different internal and external affairs, your productivity will deplete and the quality of your work will suffer. This creates more error and eats up more time fixing them. Thus, you’ll already be wasting more time than usual. Briefly above, we’ve tackled how distractions can negatively impact your quality and productivity. Distractions can be anything from small to big things or from within or outside your control. Anything that disrupts your work schedule is a distraction. This is when prioritization and delegation come in. Prioritization is learning when to say “no” to the things that don’t really need your attention. While delegation is transferring those non-priority things to the more appropriate individuals. If you can, getting a personal assistant is the best way to delegate your scheduling and other administrative tasks and routines that eat up most of your time which prevent you from focusing on the most important aspects of your business. Must Do: tasks that require your full attention and have serious repercussions when not completed immediately. Should Do: tasks that only require your monitoring so you can delegate. These tasks have serious repercussions when not completed immediately. Would Do – tasks that require your full attention and have moderate to no repercussions when not completed immediately. Usually, they can be done at a later time. Could Do – tasks that you don’t have to do so you can delegate. These tasks have moderate to no repercussions when not completed immediately. Unstructured time is exactly what it looks like, it is a time allocated for nothing. By “nothing”, it’s anything aside from a work agenda or a personal meeting. Unstructured time is your “me time”. But, you’ll probably be thinking: “I’m already busy, why do I have to allocate a time for nothing”? However, your unstructured or “slack” time is an important aspect of effective time management. Why? The more time you put into your schedule, the busier you get. And the busier you get, the more you push yourself into physical and mental exhaustion, and ultimately, burnout or even sickness. As an entrepreneur, your health is your wealth. Your unstructured time can be used for a one to two hours nap time. It can be weekly or every other day. The point is it’s the time when your brain is free to wander which allows you to be more imaginative, refreshed, and stressed-free. Thus, having more energy, attention, and focus on work. Do you really know how much time you spend on a particular task? Do you follow your schedule or do you always find yourself extending a meeting so the rest of your schedule is messed up? Time audit enables you to pinpoint which task eats up more time than allocated. You can conduct a time audit using this form below to identify potential drains on your time. Answer as honest as possible and put all your tasks and actions that you’re normally doing daily. Include anything from work schedule to personal actions like social media or phone usage. 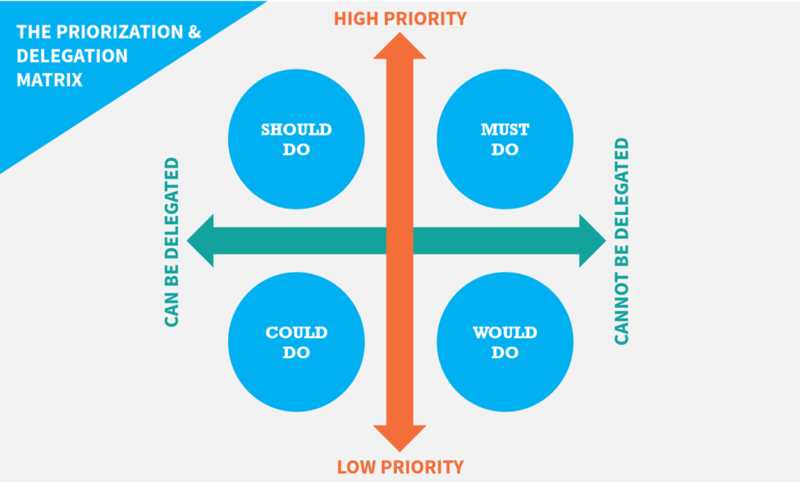 Then, categorize them according to the Prioritization & Delegation Matrix. The ‘Saved Time’ portion allows a glimpse of how much time you are saving or wasting. A negative number means the task has been performed longer than allotted. You can also sum up the ‘Time Spent’ column and do a pivot of the category to identify which category you’re spending most of your time with. 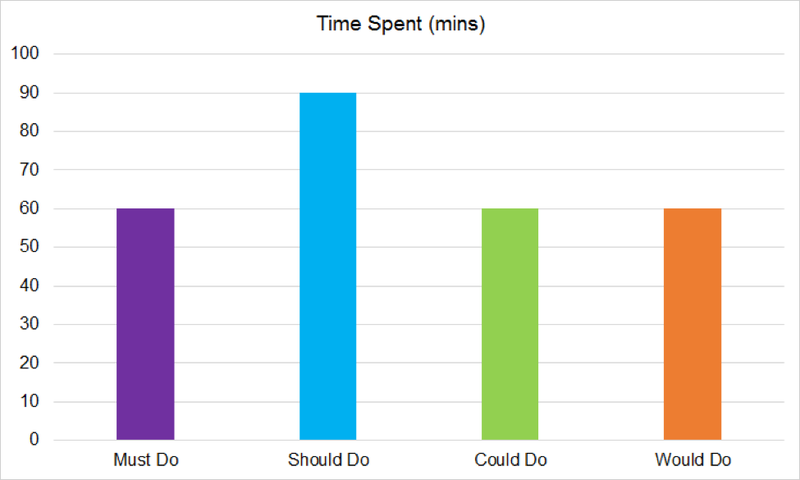 For instance, the chart above shows that ‘Should Do’ tasks and activities topped the most time spent in a day. This means that you’re not really managing your time accordingly because these activities can be delegated. Working hard doesn’t equate to the number of hours spent. Instead, working hard means working effectively and smarter. Smart entrepreneurs don’t have to spend manual laborious hours to get things end. They use technology to their advantage. Gone are the days when you have to manually input or extract your data before you can try and analyze your store’s performance. There are already readily available platforms that can automate your store’s analysis using various types of analytics. What you need to do is find what processes or activities you can invest in automation to help you save time. Moreover, your head may be filled with hundreds of tasks, plans and business concerns being an entrepreneur. When it comes to clearing your mind of too many tasks, you can take help of some of the amazing time management apps. These apps help you streamline your work and be more productive. No matter how trivial or important a task or activity is, they all affect your overall time management. What’s more crucial in effective time management is not about how much time you have, but how you make use of that time. That’s why we’ve shown your different tips to spend your time wisely. Your head may be filled with hundreds of tasks, plans and business concerns being an entrepreneur. When it comes to clearing your mind of too many tasks, you can take help of some of the amazing time management apps. These apps help you streamline your work and be more productive. They not only save a lot of time but also help you collaborate better with your team, be it in-office or remote.